New York Yankees - richest baseball club in MLB? Ever wonder how the New York Yankees operate and became the richest baseball club in MLB at some point or another? Well, some people probably know, but to those who doesn’t, here’s an explanation in a nutshell! I stumbled into a great information from someone earlier and I was amazed as to how many fans actually made the team a very lucrative business. The “behind the scenes?” Do the Math! It is estimated that 51 thousand avid fans pay an average of $28 to come to 81 home games. And that’s not all, US fans sip sodas and hot dogs at $4.50 each which generate s half of the teams sales. The other half comes from $140 ad deals and media rights. So in actuality, while fans are there to cheer, just hanging out with family, they are boosting the franchise’s profit. The “booing and the shouting” of overly-enthusiastic individuals that are merely crazy about the Yankees are not actually put to vain. They are helping the team get rich! Some season they may loss millions, but the following year they earn it back and even more revenue. At present, the MLB team is valued at $1.2 billion. So you don’t really look at it like a loss and profit game year after year because Steinbrenner also owns more than a third of the YES network which caters to 8.7 million subscribers. Pretty astounding, isn’t it? The revenue from here alone, top a quarter of a billion. Purchasing the YES network was certainly a great move of the business tycoon and owner of New York Yankee’s because they generate even more profit, making it easy to cover up the player’s expense! Thanks’ to Steinbrenner and his staff’s brilliant minds for thinking of something creative and big like this. What’s even more interesting is their plans recently. The team financed an $800 million stadium that will open in 2009; another utterly amazing move by the owner because that will deduct their stadium-operations expense, lowering their overhead cost! Ok, so there must be a whole lot of New York Yankee’s fan out there! Here are a few known facts about the team. 1. They are managed by Joe Torre since 1996. Joseph Paul Torre (that’s his real name, by the way) now ranks 6th in all-time MLB managerial wins. Now one huge credit for the manager is that, he has won them 10 AL East Division titles, 6 AL Pennants and 4 World Series title! Wohoooohhh! Way to go Joe! 2. The team is owned by George Steinbrenner, a very successful businessman who also purchased YES cable network. 3. They have 15 numbers retired, the most in the Major League Baseball. 4. The Yankees made it through the playoffs in 12 straight years. 5. They are in the AL East Division. 6. They have won the AL East for 9 straight years. 7. The team has won 26 World Series titles. Hey! That’s more championships than any other team in any North American sport! That alone is a great accomplishment for the Yankees they can be proud of! (My tongue is out, for those who hate the New York Yankees). 8. 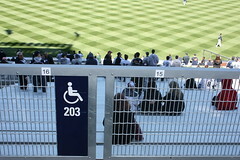 They play at the Yankee Stadium in Bronx, New York, but they are building a new stadium this will be ready in 2009. 9. There is a one and only player remaining in MLB, who is allowed to wear number 42 ever again — Mariano Rivera! 10. From 1913-2009, the team won 26 World Championships, 39 Pennants, and 47 Playoff appearances! That’s it folks! Hope that was very informative for those of you who needs a little dose of the New York Yankees history! And of course, for those readers who does not like to read tons and tons of words in a page! Don’t you just hate it? Biased as it may seem, when it comes to sports, the team as a whole are not usually the first things people remember. People may be familiar with a team mainly because their favorite player is in it, or if they do know the whole team, the first name they’d call out would be of their favorite player’s. Here are three of the Greatest Yankee players of all time who still hold much fame today. These players have also won a spot in the Hall of Fame due to their wonderful performance in baseball. Baseball definitely has a lot of talents to offer, but these three were the pioneers of their time and still hold an undying torch in Baseball history. The most famous player would most probably be Babe Ruth who not only became a Hall of Famer, he also built Yankee history by being a major part of their success in the 1930’s as they won around seven World Series titles. He is usually considered as the best Baseball player of all time, with Lou Gehrig and Joe DiMaggio sharing the same honor. While Babe Ruth only played for 14 years with the New York Yankees, Lou Gehrig had been in the team for about 16 years. He played alongside Ruth, also contributing to the success of the Yankees. He was also the youngest baseball player to join the Hall of Fame in 1939. Lou Gehrig died soon after on 1941 due to Amyotrophic Lateral Sclerosis, a brain-related sickness wherein the cells of his central nervous system would collapse and degenerate. Symptoms included being unable to control his very own movements. His illness took his life at the tender age of 37. When Ruth and Gehrig left the Yankees, Joe DiMaggio became the next “hot” thing in baseball. He had played with the Yankees for 11 years, was voted as MVP thrice, and helped the team win another 9 World Series Titles. He was also inducted into the All Star list 13 times. Babe Ruth, Lou Gehrig and Joe DiMaggio serve as the best role models for kids and adults alike. As long as you do your best in your craft, you will surely succeed, the same way they have. Our topic today is a special guide for potential baseball stars who want to play baseball not just as a hobby, but also as a full-time profession. As the saying goes, “Nothing is Impossible,” there is absolutely nothing that’s keeping your from being the baseball star you hope to be. All it takes is a little more guts and confidence in oneself, topped with hard work, and soon enough, you’ll be in the New Yankee Stadium not as an onlooker, but as the main attraction of the game. Below are tips on how you can impress baseball scouts in professional baseball as well as in college. As you continue to build the athlete in you, you will also be winning experience and expertise along the way. Who knows? You could be the next Babe Ruth baseball history has been waiting for. Scouts measure your attitude, how you treat your team mates, and your love for the game. Let’s start off with the obvious truth. Before scouts measure your baseball prowess, they would definitely want to know if you’re the man your skills describe you to be. A good pitcher with a very bad temper on court would end up getting more fouls than points. You will be working in a team and not solo; hence, if you don’t know how to respect your team mates, even your coach would not want to deal with you. Your attitude towards other people and to the game counts a lot; that said, the first thing that wins the hearts of scouts is your respect for the game and for fellow players. Let’s move on to your proficiency. Scouts look at your speed. Baseball, in layman’s terms, is game that involves throwing, catching, pitching, and running. See? Great speed equates to a good player who is capable of catching, running, and pitching quickly. If you’re speedy, scouts will have their eye on you. Scouts have their own manner of measuring a player’s running speed; however, those who are able to make a 60 yard dash at 6-6.5 seconds are in excellent form. Those who make it to 7 seconds or less are acceptable also. After their speed, they will have to consider the way you pitch, throw, or the way you serve your purpose in the team. Generally, they will have to see if you are a good player. Your physical strengths will also have to matter in baseball. For one, you must be tall, preferable someone within the range of 5’10 to 6’2. A ballplayer’s recommended height is 6’0 for a ballplayer; 6’1 for a pitcher; and for a pitcher, 5’11 is a desirable height. Also, someone between the weights of 190-200 pounds is a good pick. Base stealing is also an important feat in baseball and at times, you will have to make base stealing attempts. Those who can make it to a 3.0-3.2 second time frame when attempting to steal bases is in fine shape. There are other things scouts look for in a player before picking him to be a member of a reputable college baseball team or a professional team. What are these criteria? Only scouts know them; but you, as a player, you only need to know passion for the game and you’re good to go.